Famitsu this week has a quite a few pages about the upcoming projects from Tri-Ace, starting with Star Ocean 4. Still no platform(s) announced. Scans aren't really that good, and most of what is shown looks to be CGI, I guess its still early for them to show in game stuff. last page, has 2 ingame pictures on the bottem. It looks very good. I love the character design. The CGI is looking awesome. Gamespot, IGN and 1up have it listed only under PS3. Are they just guessing or do they know something we don't? They assume that it will be released on the PS3. They gamble on history repeating itself and their chances to win this bet are rather good thanks to the prejudice of the consumers. Xbox 360 owner have to admit that, even though the Xbox 360 is the number two when it comes to the installed hardware of this generation consoles in the world, if you just look at Japan the sales look horrible. The conclusion is that if a Japanese publisher wants to sell their game considerably in their country the only choice is to release it at least on PS3 or Wii as well and we know the Wii is too weak for an HD game. Yet it is not confirmed to be on the PS3. I personally don’t care at all, I have both! Wah this looks great! i hope SE will open their eyes and release this on 360! If SE desides to pass I will be forced not to buy any SE games ever again! It will probably be on 360, rest assured, otherwise they would not keep it secret, but because of a giant moneyhat (courtesy of Microsoft), not because Square "opened its eyes". There's nothing right about sending a game straight towards its death on a console who has no install base in Japan and who cannot even make its "Final Fantasy Killer" a million seller. Anyway, I hope it to be multiplatform, it would be the best for this game. SO3 almost sold 1.5 millions worldwide, now it'd need both the consoles to barely reach that result. Yes, I'm sure that a Japanese RPG series with a history of being PS exclusive will suddenly jump ship to a console known best for videogames aimed at people who wear baseball caps indoors. Truth to be told, the first Star Ocean was a Nintendo game. And btw Vesperia did, I don't know why SO4 couldn't. Money is the key which unlocks all doors, and Bill has plenty of money. Want me to list some more games that were once considered to be only for PS family line that have jumped ship? That's not "jumping ship", that "temporarily jumping ship", since PS3 is way behind with development, and namco wanted to earn money with easy development from the Next-Gen. As for DMC4, it may be multiplatform, but it still sold better on PS3. And we're still talking about multiplatform, as in "no matter how bad a game sells on x-console, we'll recover the cost thanks to x-console". SO4 imo won't be a multiplatform game, and that changes completely your point. tri-Ace will have to ponder very well its choice, or SO4 will probably be as good as doomed. lol, fanboys do not need much to start a battle these days. The third was good, too. Not as good as the 2nd, but good enough. Lost Odyssey sells and a number of other japanese titles have sold well on the 360 as well. Going by Tri-Ace's usual pattern would they really split up 2 of the games they do this gen on separate platforms? I guess we'll see, but I suspect Star Ocean 4 is a 360 exclusive. Hope to read more about it and higher quality images come out. Thanks for the scans. I know this is the way Star Ocean has pretty much always been, but does it bother anyone else that this is a science fiction game, and the male and female characters on the first page are still armed with a sword and bow? Mix it up a little! You could give the girl a laser pistol and still have it function similarly to a bow in combat. I just don't want to spend half my time storming medieval castles again. 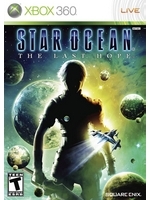 Star Ocean is exclusive for PS3. Infinte Undiscovery is exclusive for 360.